1. Gee, do you think Daly was feeling it with his putter? 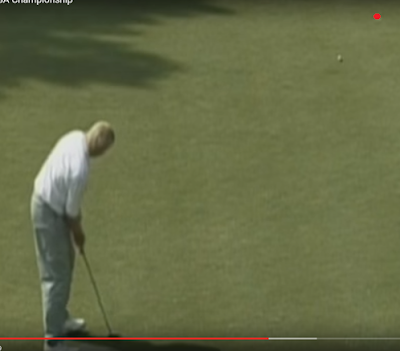 The red dot is where the cup was on this putt. John starts to walk to the cup knowing he made it when the ball is about 5-feet from the hole. 2. As nonsensical as the Dustin Johnson decision was at Whistling Straits in the 2010 PGA Championship, it would have been colossally moronic to penalize Daly for the Squeeky Medlin incident. Although it does make me wonder why Medlin ever grounded the flag stick as he had to know how sensitive the rules committee is to any perceived rules infraction. 3. I'm guessing Daly dominated this tournament off the tee. He may have had one of the all-time performances off the tee in an event. It had to be tough for Kenny Knox to watch Daly fly it 40-yards past him and still find the fairway. Daly shows one of the things I've researched statistically...the biggest advantage of length off the tee is with putting. As Mark Sweeney (www.aimpointgolf.com) showed a few years ago, there's a strong indirect correlation between driving distance and length of average birdie putt. Longer hitters are more likely to have shorter length birdie putts on average. Thus, longer hitters can putt worse and still be successful on Tour. And when you combine a long hitter that is putting well, you can get a powerful combination...especially when that long hitter is finding the fairway off the tee. 4. Following Daly's career, I would label his release as being inconsistent. When he playing well, like here, he had a little bit of an under-flip release. When he wasn't playing well, he had a flip-roll release. With the underflip release, it would just make his dynamic loft inconsistent and he wouldn't always control his trajectory or distance control (as we see in the videos). But, he could hit the ball straight with the under-flip release. 5. We'll never likely see a crowd like the Crooked Stick crowd was that week. Even the 1986 Augusta crowd (which was awesome) still wasn't like the Crooked Stick crowd due to the sheer size of the crowd. Ordinary people could buy a ticket and watch this John Daly guy hit the ball further than they had ever imagined because he was doing that in round 1, round 2 and round 3. Augusta has limited availability on tickets (although back then you could get them much easier) and Nicklaus caught fire in the last 11 holes of the event. And what was great about the Crooked Stick crowd was they were entirely respectful. Hats off in making one of the very best crowds in golf history. The driver was made out of Kevlar (what they use for bullet proof vests) instead of metal. However, the smash factor on those drivers S-T-U-N-K. It made Daly's prodigious length even more impressive. Daly supposedly used the Cobra Ultramid because he kept cracking metal and persimmon drivers and he couldn't crack the Cobra Ultramid.